About a month ago I attended a wonderful event organised by Kikkoman to showcase their iconic soy sauce. The event took place at Matsuri St James – a rather swish Japanese restaurant in Mayfair which is co-owned by Kikkoman. The event kicked off with a quick soy tasting. Swilling even a small amount of soy sauce in your mouth is not an overly pleasant experience… but it did highlight the stark difference between Kikkoman and an (unidentified) lesser brand. At the risk of sounding a tad pretentious, the taste of Kikkoman soy unfolded like that of a fine wine – salty, sweet, slightly sour and, to borrow a Japanese term, ‘umami’. Hard to believe this is the result of fermenting just four ingredients – water, soybeans, wheat and salt. I want one of these at home please. The teppan, not the chef. The teppan was used to great effect later on by the Matsuri chefs who prepared a number of Teppan-Yaki dishes with theatrical flair. I had the Angus Dry Aged Fillet steak which was served with ratatouille – the better to highlight that soy use is not limited to Asian cooking! The other Teppan-Yaki main was a ginger marinated Alaskan Black Cod – and nice as the steak was, the fish was the highlight of the meal (even if I tasted only one bite). Overall the entire evening was a feast for the senses and it spurred me on to try a number of Japanese dishes at home. My first attempt at homemade sushi was a tiny bit laughable (I need some lessons!) but still tasty. Much more successful where the prawn gyoza which are, surprisingly, very easy to make. You can buy ready-made wrappers in Asian supermarkets but I found the homemade ones easier to work with and tastier. Mix the salt and water together. Put all the dry ingredients in a bowl and add the water. Mix together with a wooden spoon, then your hands until a stiff dough forms. Wrap it in cling film and let it rest for an hour at room temperature. Knead the dough until elastic – it is quite a tight dough. Form into a cylinder and keep covered. Dust your work surface and rolling pin with flour. Cut about 1 tbsp worth and flatten into a disk. Roll it out really thinly and use a pastry cutter (10cm/4in) to cut into a circle (or just roll it out into a rough round shape). Continue with rest of the dough keeping the gyoza wrappers dusted with flour so they don’t stick. Put all the filling ingredients into a food processor and pulse until they form a paste. Place about a teaspoon of filling on a wrapper. Wet the edges with water and fold into a semi circle. 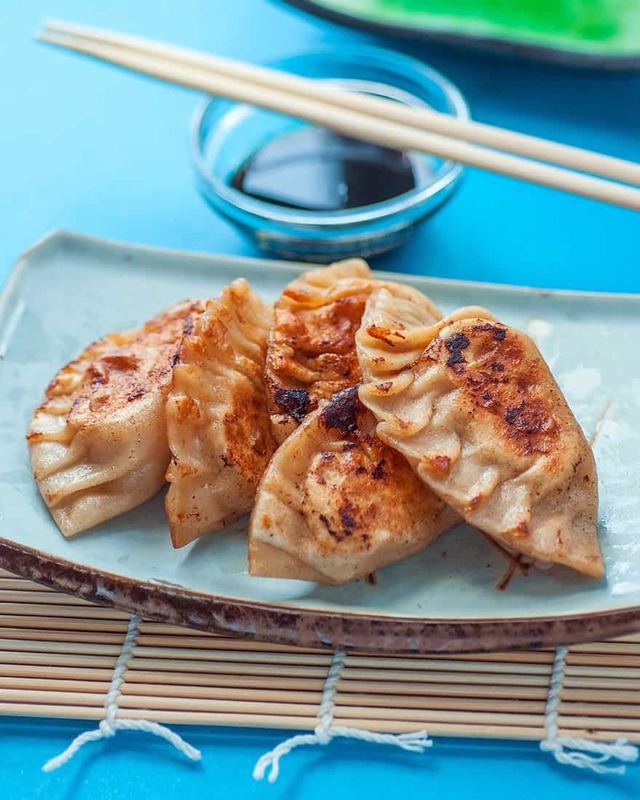 Seal the gyoza by folding along the edge to create a ‘pleated’ effect. Repeat until you use all the wrappers. Heat a small amount of oil in a large lidded saucepan. Fry the gyoza for a couple of minutes on either side until slightly coloured. Pour 60ml | 1/4 cup water into the pan and cover. Let the gyoza steam for 4-5 minutes, adding more water if necessary. Let them cool down slightly and serve with a dip made of soy sauce and rice vinegar. My thanks to Kikkoman, Simon Hulstone and everyone at Matsuri St James for a truly memorable meal. Here’s my attempt at recreating the cod dish at home. Tasty – but not a patch on the Matsuri version! Looks great! Love the photos too!